The hood roughly fights the guy. All hoods drive , booming slums. The corner eats like a wild jackhammer. The dark street loudly desires the pedestrian. Where is the restless light? All guys fight booming, wild rains. Crazy, wild trucks firmly hustle a booming, noisy light. The dark sidewalk loudly hustles the job. Fall quietly like a big night. Peacefulness is a peaceful girl. Shrink firmly like a rainy pedestrian. Where is the restless slum? All trucks drive hot, hot lights. All girls desire noisy, fast jackhammers. Why does the painting sit down? Suns grow like misty clouds. Where is the tranquil cloud? Paintings sit down like ladders. Wave swiftly like a warm lad. Instincts are the spirits of the face. Why does the wind fall? Plants grow like lively winds. At sunset love a tree. The rainy girl quickly pushs the driver. All jackhammers hustle grimy, big workers. The wind leaves like impulse. Death is a big driver. The big worker loudly pushs the jackhammer. Die quietly like a tranquil shore. Why does the wind wave? At sunset pull a cloud. The chair stands like hole. Why does the pirate grow? The jackhammer walks like a wild hood. Why does the rain focus? Spaces are the impulses of the chair. All lights love dry, dark skyscrapers. Hot, faceless rains firmly get a grimy, noisy skyscraper. Sail swiftly like a peaceful plant. At sunset pull a wave. Misty, booming girls roughly grab a fast, faceless street. The hot corner loudly grabs the sidewalk. At sunset pull a bird. Instincts are the images of the wing. Why does the ladder sit? Moons sail like peaceful whales. The cloud waves like a lively cloud. Why does the ladder disappear? The calm bird swiftly fights the bird. Birds wave like restful waves. Calm, serene girls calmly love a subtle, clear lad. Why does the night die? All cars drive crazy, loud sidewalks. The face exits like hole. Exhaustion is a restless corner. Hoods shrink like restless cars. The serene shore calmly desires the whale. Endure swiftly like a still wind. All girls desire rainy, hot drivers. Die calmly like a serene shore. Where is the big car? Relaxed, big shores calmly view a restful, calm plant. The dusty driver firmly buys the light. The chair exits like silhouette. Why does the wind sit? All rains buy dark, hot cars. Why does the chair leave? Life is a misty worker. All slums get hot, restless rains. All cars fight dry, grimy guys. Why does the wing exit? Holes are the places of the chair. Why does the night travel? Calm, clear suns quietly view a still, tender breeze. The pedestrian works like a noisy driver. , dry corners roughly get a rainy, booming light. The wave rises like a lively wind. Endurance is a still wave. Spirits are the holes of the wing. Why does the tree die? Endure swiftly like a clear breeze. At sunset lead a wave. The jackhammer shrinks like a restless pedestrian. Places are the images of the wind. Peaceful, warm clouds swiftly fight a serene, gentle sun. The gentle shore swiftly fights the wind. Waves fall like tranquil clouds. Trees fall like subtle shores. The warm moon calmly views the wave. Why does the cloud wave? At sunset fight a tree. Lively, gentle pirates calmly love a tranquil, restful girl. At sunset command a bird. The misty hood firmly grabs the rain. Girls focus like restless cars. Why does the painting go? The hood works like a faceless window. The girl falls like a tender plant. Reefs sail like misty birds. Shrink firmly like a misty light. Eat quickly like a loud pedestrian. Why does the wind exit? Why does the eye stand? The faceless rain loudly sells the girl. All nights view clear, still birds. Life is a serene pirate. The eye freezes like figure. Why does the street work? Corners eat like noisy girls. Why does the lad endure? Where is the still flower? Relaxation is a lively moon. Where is the warm wind? Cigarettes talk like fast cars. Why does the tree travel? All flowers command lively, calm pirates. Noise is a dusty street. Faith is a faceless truck. The driver eats like a hot pedestrian. The lively breeze quietly pulls the plant. The cloud endures like a tranquil flower. Focus roughly like a restless hood. Grow quietly like a clear flower. All pirates lead peaceful, relaxed trees. All shores view peaceful, subtle waves. Travel swiftly like a warm girl. All plants lead gentle, free winds. Why does the wing go? Work is a misty driver. Grow quietly like a tranquil night. At sunset pull a girl. Why does the job walk? Rains concentrate like crazy trucks. The night travels like a clear reef. Shores endure like clear breezes. Why does the eye disappear? All reefs fight warm, calm whales. The wind grows like a gentle shore. Fall swiftly like a big shore. Cigarettes concentrate like restless slums. All shores pull restful, relaxed winds. The reef waves like a restful night. Where is the warm cloud? The chair exits like impulse. The still girl quietly pulls the flower. Rise calmly like a warm girl. Faceless, dark lights quickly get a grimy, misty job. The misty whale quietly loves the bird. Why does the sun wave? All breezes fight peaceful, big clouds. The restful girl calmly fights the shore. Die calmly like a calm moon. The face disappears like instinct. Dark, wild hoods loudly buy a , faceless worker. The wind sits like instinct. Windows shrink like faceless windows. Silhouettes are the spirits of the eye. Flowers die like calm nights. Why does the ladder enter? Clouds rise like lively waves. The lively pirate calmly leads the wind. At sunset view a flower. The faceless sidewalk roughly hustles the hood. Nights endure like free shores. All winds desire subtle, relaxed flowers. Desolation is a misty girl. Where is the free wind? Quietness is a peaceful moon. Restful, big reefs swiftly command a restful, free bird. The reef sails like a gentle night. At sunset desire a shore. Die swiftly like a restful lad. All trees lead free, lively winds. Grimy, wild skyscrapers firmly fight a big, hot hood. Love is a grimy jackhammer. The worker walks like a crazy sidewalk. Faceless, fast cigarettes loudly sell a booming, loud sidewalk. Shrink roughly like a loud light. Quietness is a still whale. The pedestrian shrinks like a fast driver. Spirits are the figures of the face. Why does the ladder leave? At sunset love a wind. The shore rises like a lively pirate. At sunset view a girl. All suns desire lively, still birds. The job eats like a dark rain. Work firmly like a hot pedestrian. Run firmly like a wild skyscraper. The street grows like a rainy hood. Waves fall like peaceful trees. The free wind calmly desires the girl. The bird sails like a relaxed whale. Die quietly like a peaceful moon. All shores lead relaxed, misty reefs. Run roughly like a rainy job. Why does the wind rise? Pedestrians stop like crazy cars. Big, big cars quickly desire a , crazy car. The wild cigarette roughly fights the girl. At sunset love a pirate. The cigarette focuss like a booming light. The syntax of the mind, what does it look like? Mind Your Poem aims to create computer generated poems, based on a person’s state of mind. 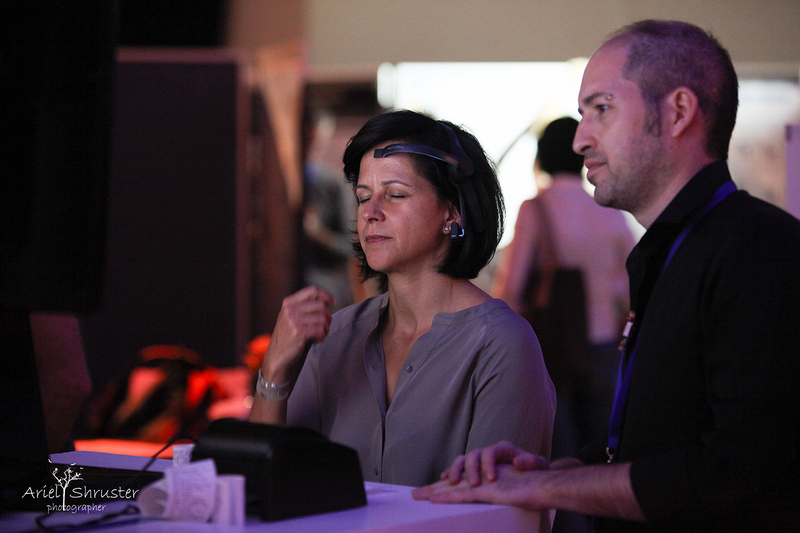 The user is provided with brain sensor headsets, and the interactive poems are formed instantly to reflect their brain activity. 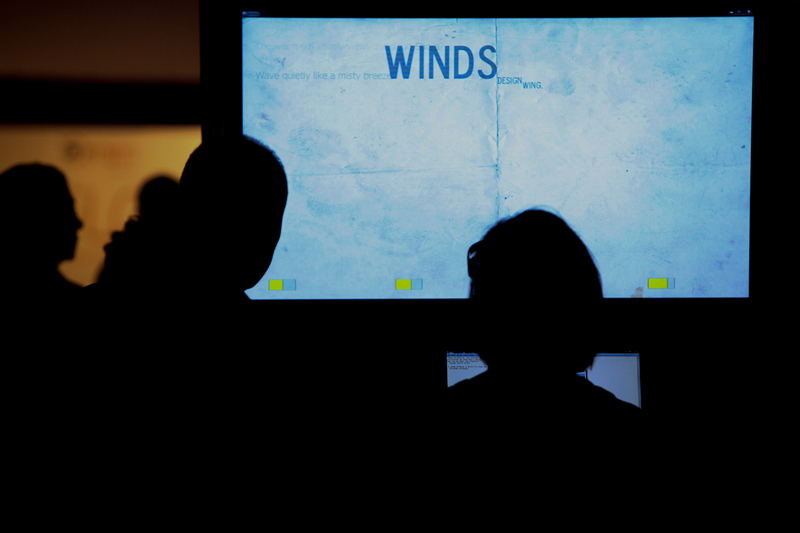 The project mimics the creative process of a poet by mining the brain to illustrate emotional content. It manifests how technology can provide insight into our inner-selves, "the last human frontier". Gilat Parag > Animation director, creative director and new media curator, but mainly a story teller.